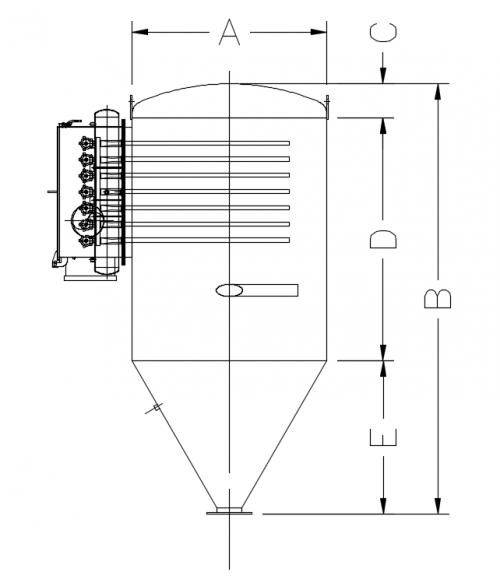 Do You Need a Filter Receiver Tubular System? Talk With One Of Our Engineers Today. When product and air enter into the filter receiver, the product must be separated from the air stream through the use of filter receivers. 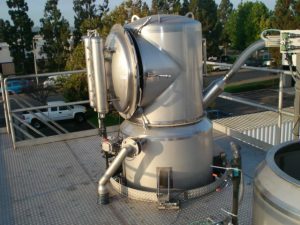 When material enters the receiver from a silo or surge bin, the air passes through a wall of filtration material, depositing any dust on the filter cartridge exterior. 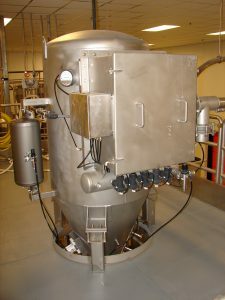 The product falls into the discharge cone, allowing the material to enter into the customer’s process. After time the deposited dust must be removed from the cartridge walls. This is done through a quick pulse of compressed air traveling through a venturi to produce a shockwave which knocks the dust from the cartridge wall. The tubular design offers a style that does not require confined space permits in most applications. Changing the filter is much cleaner and easier than traditional bottom load filters. Standard construction for a filter receiver body consists of a heavy-duty carbon steel welded body, interior safety grid, tool free 22” x 40” hinged maintenance door, exhaust vent, and AEF white exterior. Cartridge cleaning is accomplished through an auto sequence reverse pulse timer housed in a NEMA-4 blow down enclosure. Cartridge condition can easily be monitored using the included pressure differential indicator.